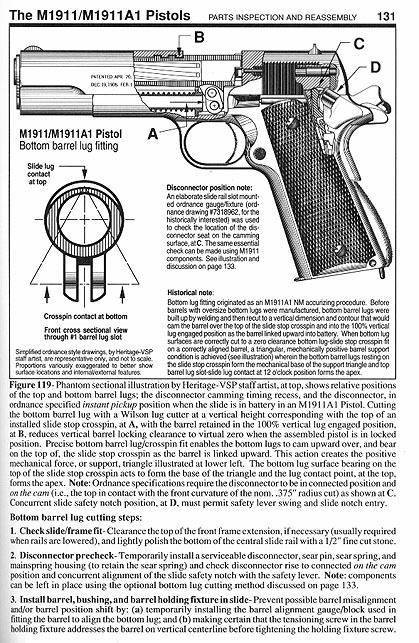 The U.S. M1911/M1911A1 Pistols and Commercial M1911 Type Pistols- A Shop Manual Vol. 2. Volume 2 adds to, but does not replace Kuhnhausen's original Volume 1. Expanded edition - 207 pages with plastic laminated soft cover. This brand new superbook is absolutely loaded with new & updated material, parts dimension & hardness specs, and the nuts and bolts tech data required to dimensionally inspect, restore, repair & build super accurate, super reliable, "blueprint" quality carry and competition grade M1911's. With Kuhnhausen's original Volume 1 and the new Volume 2 - you have in hand more practical M1911 info & tech data than ever before published in the entire history of the U.S. M1911 & M1911A1 Pistols!